Titan One review by herobyclicking at N4G.com! Thank you for your time and effort in reviewing our product! “The Titan One is available online for approximately $60 USD. A device was provided for review purposes. More information can be found at ConsoleTuner.com. 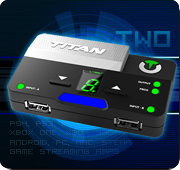 A digital modding device for console controllers that both makes me giggle with glee and shiver at its application for online gaming, the Titan One is a curious device. The Titan One really shows its colors by working as intended as a sort of Rosetta Stone for console controllers. The idea behind this feature is that you should be able to play just about any modern, popular controller on with just about any modern, popular console. Wired Xbox 360 and PS3 controllers work well with no issues on with the PS3, Xbox 360 and PC. Using wireless controllers requires a bit more attention with syncing and authenticating for Xbox One, PS4, PS3, PC (Steam) and Xbox 360. Using the crossover option, which is foremost listed on the box and features is easy enough, though not necessarily practical. Due to obvious restrictions between the four aforementioned consoles (Wii U is supposedly in the works, I would love to use my Xbox 360 controller for Mario Kart). Taking time to authenticate (PS4, Xbox 360, Xbox One), following the slightly convoluted flow chart included with the device and confirming on with the documentation on the website took slightly more time than I was expecting. However, trying the different controller system combinations was actually a lot of fun. I grinned when I got my Wii U Pro controller to play Bioshock Infinite on my PC. Would I use the crossover function often? Was it practical? No and not really. It was just super freaking cool. Once I figured out the different ins and outs of the controller functionality and crossover capabilities, I Iooked at the GamePack and the Plug-ins. I appreciated the ease of loading in a pre-designed GamePak. Modifying and adjusting these standard mods for the controllers took a little head scratching but the benefits were quickly realized. Quick scope control, super fast melee and rapid fire with adjustment for burst length was impressive. Loading different “classes” or weapon specific load-outs took a bit of wrapping my head around in the heat of battle, but with practice it could be mastered. Not that I did, but I could see how this could be so. Likewise the plug-ins were especially easy to activate and implement. The UI is familiar and intuitive making core aspects of the Titan One glow with even more possibility. Long for the days of keyboard and mouse but want to play on your console for FPS? Easily remap your controller? Record combos to be unleashed at flick of stick (or button combo in this case)? You’ve found your device. I really wanted the device to also act much like the xpadder and joytokey software which allows the user to translate keyboard bindings and mouse movement to controllers. It just seemed like a natural fit. I had to hold on to my horses as this feature is not available. Yet. While the GamePacks available are among some of the more popular titles, the current selection is limited. The community is growing and creating the new scripts to be used with the Titan One, though by and large they lack the same kind of polish that the GamePacks do. Each day I checked it seemed that a new script was created. This is perhaps the most interesting aspect of this device. The ingenuity of the dedicated user can create, and will create a healthy catalog of scripts. Scripts that will be used to modify any controller. When we cut down deep beyond how clever and interesting this usb device is, it has a following of people who want to hack and mod their controllers without the need of ruining their controllers or to be detected online if used. The Titan One does that and will presumably continue to do this as long as the device is supported. It’s a sort of cloaking device merged with a performance enhancing drug. Gamers can unleash their GamePacks and scripts on unsuspecting opponents online. Sportsmanlike? Fair? Most likely no, but it works, and works pretty well. If you have desire to use your PS3 controller on your Xbox 360 (or vice versa, or any other number of combinations, etc) and then want to mod the hell out of it (without cracking it open or dropping a ton of money on a modded controller), the Titan One is efficient device for such things. Though next time you get taken down in your favorite FPS online and didn’t seem “right”, it may be you got a little Titan One action. “The Titan One is the official successor of GamepadProxy device, which made it possible to use any controller to any current console! The Titan One supports features such as next-gen controller support, Keyboard & Mouse Support, Game Pack’s completely self-created scripts, button mapping and other plug-ins and features! With the dongle itself was a short quick start guide and a mini USB programming cable to the Titan One and update. The review sample came with firmware 2.05, where there is already the update 2.06 which the DualShock 4 can be completely mapped! To use the Titan One properly, it needs the software manufacturer, the “GTuner Pro”, which can be downloaded from the website for free download. In it there are countless recruitment and modification options for the Titan One. Especially for the DualShock 4 and its status LED’s there are extra functions, such as the dimming of the Status Bar and an exclusive Titan One Feature: A Status LED on the USB dongle itself, which communicates with the DualShock 4. We come to the heart of the Titan One: The Controller Support! Supported are all original controller, and a whole lot of third-party controllers, such as Mad Catz, Logitech, Razer or Controller of GameStop and of course the mouse & keyboard. This includes steering wheels & Arcade Fight Sticks, for each game style is so worried! These can also be mapped completely free, absolutely every button is fully assignable, the same goes for the keyboard. To use the desired controller is wireless, it needed but usually one adapter, such as a Bluetooth dongle for the Playstation and Wii controller, or a wireless adapter Microsoft. Another feature that for some reason a purchase can be: The Game Packs & plug-ins! For probably the most popular game genre, the shooter, are those “extras” probably more of a curse than a blessing, nevertheless many hope that through such tools an online advantage, such as a aimbot, or improved target skills. The Titan One offers exactly this Game Packs for the most popular shooters like Call of Duty and Battlefield. New to the list are about The Last of Us and the brand new Destiny! There are also constantly new, mostly added by the community, but also even you can create such scripts! It also has useful plug-ins that you can do this directly from the console, how to record about certain key sequences and to play back on demand. Finally can say the following: With the Titan One very good update of the GamepadProxy device has succeeded! There are constantly new features added and also the community is in specifically for the Titan One the intended active forum to the product to improve steadily. Also the support responds quickly and can also loose only if you are satisfied with the product itself again! I was betrayed also, that soon a new update appears: A Tournament firmware! Thus, the Titan One are also used in official tournaments! This feature was requested by “SCUF controller”, so no cheats, mods, scripts or the like are possible. Another update: The so-called “Visual Game Pack Creator”. This makes it easy to create your own mods and drop function drag and they should be better than ever before created mods of the community! Titan One review by Joe Marchese from NewGamerNation.com! Thank you Joe for your time and effort in reviewing our product! “ One of the most hotly debated topics that gamers experience is their console of choice. Some people have sworn allegiance to one brand or another and things often get ugly shortly after the topic is mentioned. When you ask them why they prefer one console over an other, you’ll often hear that it is the controller layout they care about most. Peripheral companies have made millions of dollars making third-party controllers that mimic the competing system’s layout. However, those controllers seem like a great idea but almost always have a different feel to the hardware. Now, there is a better solution for this problem and that lies with the company ConsoleTuner and their latest product; the Titan One. The Titan One is a simple piece of hardware that lies between your controller and the console itself. The Titan One will then allow you to use almost any controller you want with any console you want. This includes using an Xbox controller with your PlayStation 3, a PlayStation 4 controller with your PC, etc. The combinations are vast and it allows you to take your favorite controller with you no matter where you play. You maintain the original first party feel and still get the performance you require from gaming today. The Titan One does a great job of supporting all the major consoles and giving gamers a great way to play what they want to play, the way they want to play it. The setup process is relatively easy and getting is started doesn’t require too much time or manipulation. This unit does require a PC to manage, but it doesn’t need a lot of processing power to run, just a USB port and the software itself. Simply install the software, plug-in the Titan One via the programming port, update to the latest software. After that, you are pretty much ready to go. Just plug-in your favorite controller, plug that in to your favorite console and within seconds you are ready to game. The Titan One also supports wireless applications when using wireless controllers. You simply plug-in the device to a computer first, link the two devices and that controller will now wirelessly link to the Titan One for all your wireless applications. The Titan One has also been updated to fully support the PlayStation 4 and Xbox One. Both controllers work perfectly with the Titan One and it is one of the few solutions for getting your next-gen controllers working on other systems. 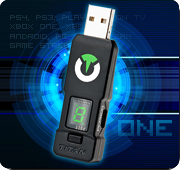 Overall, the Titan One is a very simple device that gives you a ton of flexibility in your gaming habits. Whether you prefer an older controller or you want to take a mouse and keyboard on the go, all options are on the table. The Titan One was easy to use and within a few minutes you can get set up and ready to game. Best of all this device will not void your warranty, it isn’t going to flag you via online services and is a near perfect solution for those looking to expand your gaming horizons. If you’ve ever not played a game or a console because you didn’t like the controller, button layout or any other controller related issue, this device should be on your “must own” list. Once you realize the potential this device has, you’ll never need another controller solution again.